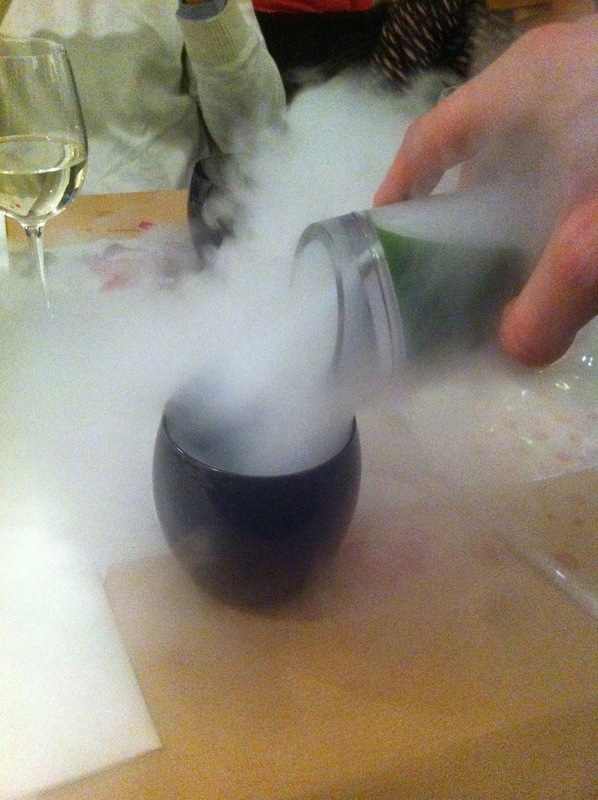 On Thursday, I went to dinner at the 'Artistic Dining Room' in Hackney. It was inspired by artist Yayoi Kusama, who herself is kind of crazy. Painting polka dots and creating very interesting paintings and sculptures. So, crazy things happen.. that's why this week's Restaurant Friday is on a Saturday. I found out about this event a few weeks ago when I was walking back home from Broadway Market and bumped into that gallery. It looks really nice and the special thing about it is that every once in a while they offer 'artistic dinners'; evenings which are thematically and culinarily inspired by specific artists. As I really like the art by Yayoi Kusama (whose exhitbition I saw already a while ago) and the dinner was to be molecular gastronomy, I found this a great event to go to. ..And it was actually great, the place was decorated with dots everywhere (even in the bathroom!!!) and they paid a lot of attention to details. While an art student was presenting Yayoi's art and explaining it, dinner was served and I absolutely loved it. I won't talk a lot about it, just let the food-pornish words and photos have an impact on you. - Phone pictures..sorry for that! You should definitely check out this place, as every time the theme is inspired by another artist. It is something different to the dinners one normally has and at least for me that was a unique experience. Created by Jozef Youssef, who is founder of the collaborative kitchen project Kitchen Theory and author of 'Molecular Gastronomy at Home'.